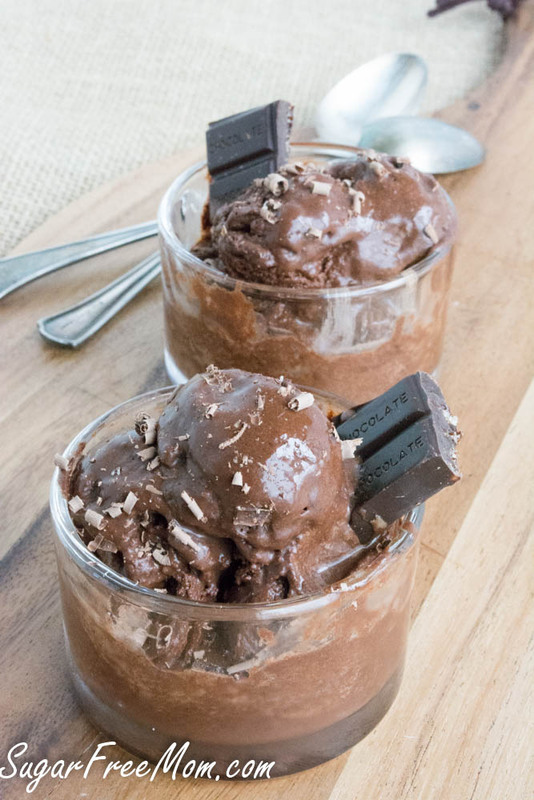 This decadent Chocolate Sorbet is made sugar free, dairy free, egg free, low carb and low in calories, just 15 per serving! 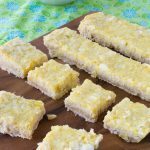 It’s super easy with just a few ingredients! The hardest part is waiting for it in the freezer! I could never live without chocolate. It would be a sad life. And I’m not into sad. 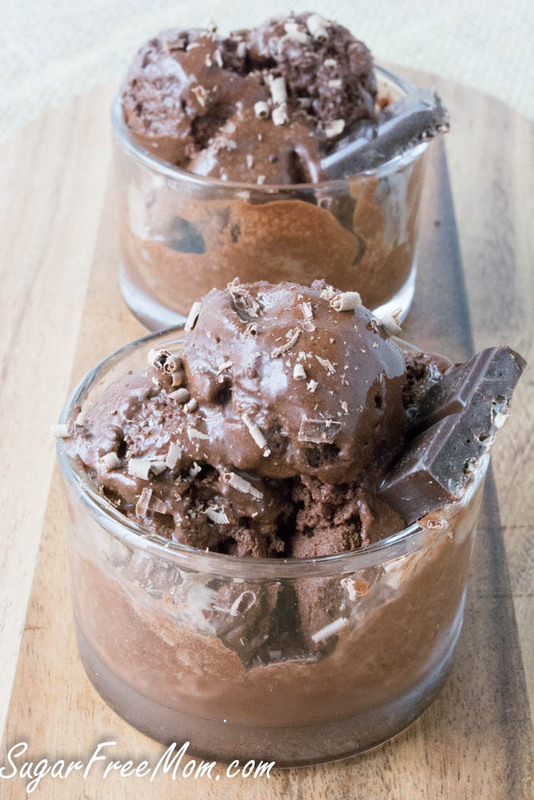 What I am into is making chocolate recipes that feel indulgent but are anything but. Recipes that require just a little time but provide the biggest bang for my buck. This recipe is one of the easiest I’ve ever made and dare I say one of the best! 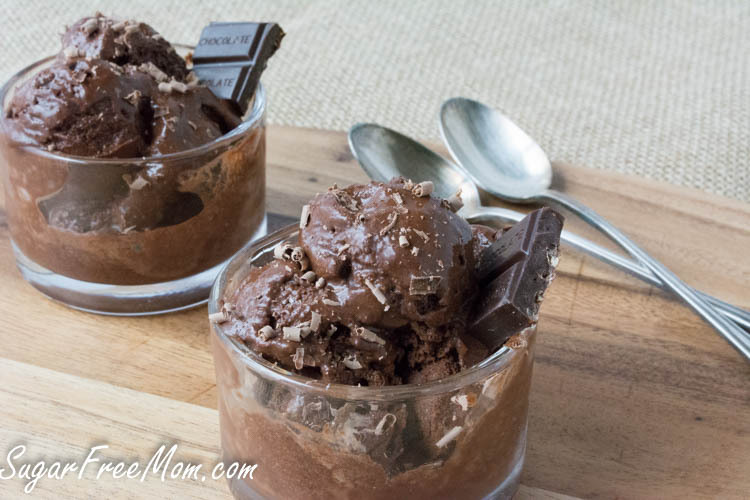 When you can have a creamy, chocolate frozen treat for just 15 calories for a 1/2 cup and just 2 net carbs I think that’s pretty amazing! It all began when I was on my treadmill in the basement watching a recorded Ina Garten on the food network. Do you exercise and watch cooking shows? It’s honestly where I get my most creative ideas, on the treadmill and watching a cooking show, go figure right? One idea just snowballs into another and then I slow down on the treadmill so I can type it into my notes on my phone so I don’t forget! So obviously Ina isn’t into sugar free cooking or baking but she inspired me to create this recipe today. Sorbet is more of a soft serve so freezing it after it’s been in your ice cream machine is the best bet. 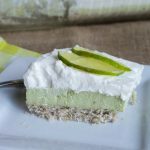 It’s a perfect allergy friendly dessert when company comes over! 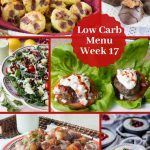 No one needs to know it’s low carb, sugar free, or low in calories because they will never even notice! All they will care about is how rich and creamy it is! 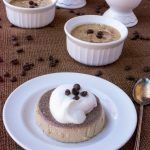 Ina Garten used espresso but I used decaf coffee so my kids could try it. If you don’t have liquid chocolate stevia, use vanilla or clear. If you eliminate the stevia the sorbet will not be as sweet because the one cup Swerve is not one for one in sweetness to typical sugar. Whisk the first 4 ingredients together. 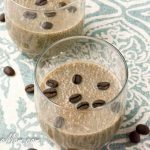 Add the water, coffee, vanilla extract and chocolate stevia to a blender. Pour in the dry ingredients into the blender and blend it on high until thoroughly combined. Place mixture into the refrigerator to chill for one hour. Once chilled add the mixture into an ice cream machine and follow manufacturers instructions. Mine was thick and perfect after 20 minutes. Remove from machine and place in a container to freeze for one hour or overnight, until firm enough to scoop. 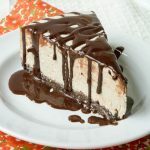 Enjoy with your favorite chopped or shaved chocolate over the top! Sounds good and seems really easy! 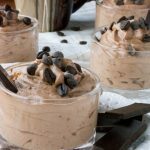 Can you recommend a good inexpensive ice cream maker? I don’t have any experience with them. Thank you. I’m sorry I use my ice cream attachment for my KitchenAid Mixer. I made mine with my Cuisinart Ice Cream maker. Williams Sonoma has one on sale right now for $59 with two ice cream containers! That a bargain! Have 2 in the freezer so you can make more than 1 in a day! Um, this looks amazing! 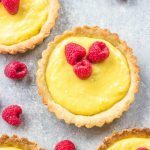 Adding to my low carb recipe list! I don’t use any coffee whatsoever – can you suggest anything to replace it with as this looks delicious! Why don’t you try Chi Tea?? that might be pretty good?? Would full fat coconut milk work in place of water? Yes I’m sure that would be tasty! Is there another way if I. Don’t have an ice cream maker?? Maybe try thickening the mixture in a high powdered blender. You might also consider but it would increase calories and carbs but replace the water with milk of choice. Then freeze. Hope it works for you! I mixed it up last night and made it this evening. I was actually concerned when I saw the picture because it looks “creamy” and there isn’t one ingredient that would make it creamy! Well, I’m here to tell you……it certainly isn’t icey and it’s kinda creamy (for some reason) only that is deceiving because it does melt rather quickly. But – it’s D.E.L.I.C.I.O.U.S. And, it’s low calories, no sugar and I am even using it for an hCG P2 option. Had it for my treat tonight. I love it! I used my new powdered Xylitol. It tastes just like sugar. Next time I’ll try the powdered Erythritol though. I think the Xylitol may actually be too sweet for this. Great recipe though. THANKS!! Also the Swerve is half the sweetness to Xylitol so I bet it was super sweet, almost too much if you used chocolate stevia as well. Can you eliminate the swerve and just use the liquid stevia? Why both? You could if you prefer but I use both in recipes as some people find an aftertaste with just stevia or a cooling effect with just Swerve. Where do you purchase Swerve? Can you find it in stores with the Stevia? I’ve seen serve at my local supermarket in the healthy section and you can buy it online as well. My Publix sells the Swerve. Do you think Truvia would work as the sweetner? Yes but it is much sweeter than swerve and the liquid stevia i have used. So use less than you think and taste and adjust. I’ve never tried Swerve because I didn’t know what it was but I did read your other post and now I’m interested to try it. However, if I want to try this recipe before I get a chance to buy the Swerve, would I use one cup of sugar (I use evaporated cane juice) or should I use less? 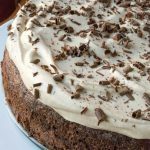 Also, how important is the chocolate stevia to this recipe? Do you use Swerve in place of brown sugar in recipes or how does that work? Thanks for all your info!! 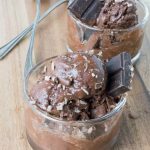 HCG does not allow cocoa powder on P2…..
I’m so happy to have found your sorbet recipe – been looking for low carb chocolate ice cream that isn’t high fat! I’m having trouble reaching your net carb count, though.. do you count swerve as zero carbs because it’s a sugar alcohol? I don’t count Swerve in nutrition info because it has little to no effect on blood sugar. i just made this and the swerve stayed very granuale, like i have to chew it… any thoughts? think i can remix it with something then reprocess it in the ice cream machine? It it way to sweet for my taste. Thanks! Did you use powdered confectioner’s Swerve? I think that would dissolve better for you than the granulated. I think you could try it in a high powered blender then try it back in the ice cream machine. Is the swerve necessary? I don’t like to use it if I don’t have to do so. 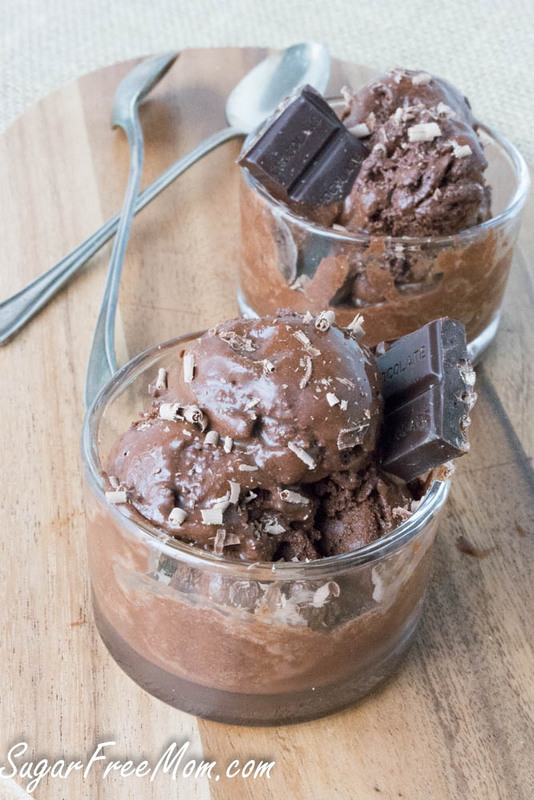 Would this recipe come out the same if I use more chocolate stevia instead? You just might need to add more stevia, just taste and adjust it as needed. Thank you very much! It came out wonderfully! 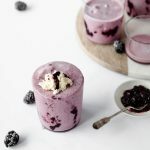 Can i use vitamix instead of ice cream maker?? That would probably work, but I’ve not tried it so let me know. I have used other brands of erythritol and have noticed Swerve seems to be finer and able to create a better texture. But it would be fine to swap the brand of erythritol.